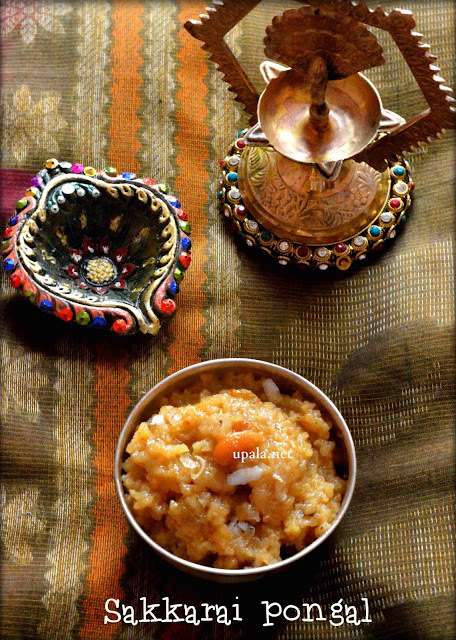 Sweet pongal/Sakkarai pongal/Sihi pongal is a famous traditional recipe prepared during festival time. Normally Chakkarai pongal is made with out dry coconut in Tamilnadu. After tasting this yummy pongal in a temple in Bangalore, I really loved the coconut flavour in this pongal. So I tried the Karnataka style Sihi pongal at my home and it was a hit. 1) Take Raw rice and moong dal together and wash them. Add water and pressure cook for 5 whistles. 2) Mash the cooked rice with a ladle and set aside. 3) Add water just to immerse the jaggery and boil it. 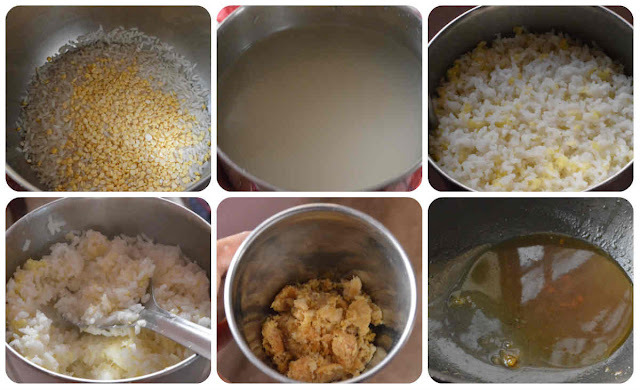 4) After jaggery dissolves completely in water, filter it to remove any impurities. 5) Boil the jaggery water to get syrup consistency. No need to check for any string consistency, once it forms sticky paagu that is enough. 6) Add the cooked Rice and dal to Jaggery syrup and mix well. 7) Add Cardamom powder, Nutmeg powder, edible camphor and mix well. 8) Add grated dry coconut and mix well. 9) In another kadai fry Cashews till light brown in ghee. Next add Raisins and fry till they puff up, add it to Sweet pongal. Yummy Sweet pongal is ready. 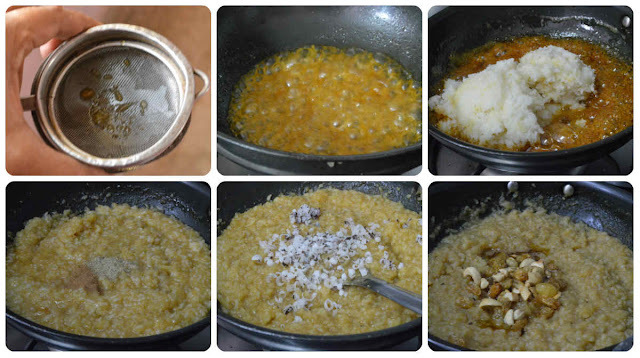 1) You can also fry the grated dry Coconut in ghee and add. Also if you dont get dry coconut/Khobbari (Kannada)/Copparai (Tamil), you can add dessicated fresh coconut. Increase thee quantity to 1/4 cup if you love dominating coconut flavour. 2) Some prefers to add 1/2 cup of milk get milk flavour. 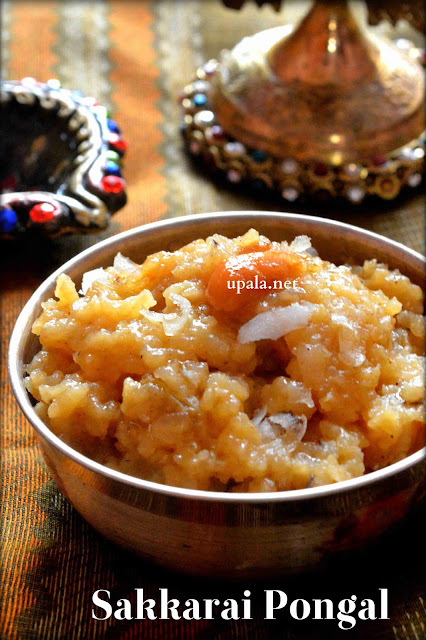 5) You can also reduce the ghee to 2 tbsp if you are diet conscious. 6) Slight roasting of Rice and moong dal in ghee before cooking gives enhanced flavour. 7) Jaggery needs to be of good quality (Paagu vellam) for sweet pongal to come out well. I have used dark coloured variety of Jaggery.